GOOD HOPE – Good Hope Middle School received the highest middle school award presented at the South’s BEST, or Boosting Engineering, Science and Technology, robotics championship held at Auburn University Dec. 3-4. The team received the first-place Middle School BEST Award, which is given to the middle school team that most embodies the concept and spirit of the competition. The winner of the BEST Award is judged on a combination of project engineering notebook, marketing presentation, team exhibit and interview and team spirit and sportsmanship. BEST Robotics is a national robotics program for middle and high school students that culminates in one of three regional championships, including South’s BEST. The South’s BEST championship is headquartered at Auburn University and this year featured the top 58 teams from 16 hubs located in five southeastern states. Good Hope Middle School is part of the North Alabama BEST Robotics hub, which is headquartered at Wallace State Community College. 2016 marked the 16th year of the South’s BEST championship. The BEST Robotics program is the only such program in the nation that is available to all schools at no cost. The not-for-profit, all-volunteer program challenges students to design, build and market a robot to use in a six-week-long series of competitions, culminating in the South’s BEST championship, which is hosted by Auburn University’s College of Sciences and Mathematics and the Samuel Ginn College of Engineering. During the championship, teams competed in a series of head-to-head matches on a playing field designed for this year’s game titled, “Bet the Farm.” The challenge behind this year’s game was for each team to create a robot that could plant corn seeds, harvest and deliver ripe corn, hydroponic tomatoes and hydroponic lettuce, secure loose pigs and feed them, and turn on a water valve. Teams also competed to receive awards in categories such as engineering design notebook, marketing presentation, team exhibit, interview and team spirit and sportsmanship. Awards were given based on criteria such as demonstrated teamwork, a positive attitude and enthusiasm, school and community involvement and creativity. 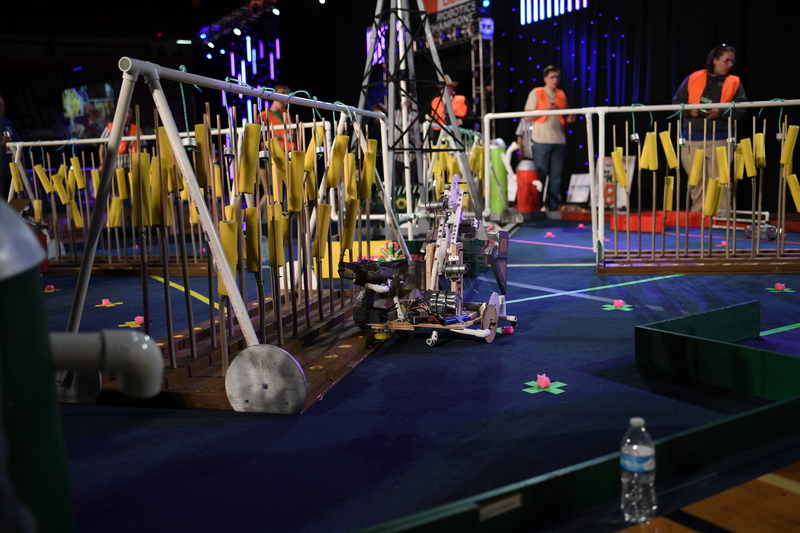 The primary objective of the BEST Robotics program is to provide students with a real-world engineering experience that incorporates the practical application of math and science; prepare students to be technologically literate and thus better prepared to enter the workforce; help students develop leadership, project management, teamwork and organizational skills; and develop confidence and competence. More information on South’s BEST, including a detailed game description, can be found at the website at www.southsbest.org.